The long awaited return of NASCAR sanctioned racing to dirt tracks is here, and this live blog is here to help you follow it. Watch live on SPEED, read our preview here and check out the live blog itself below. Thank you for joining us for tonight's event! The archive of the live blog is below. 11:35 - The celebration for winning tonight's event? Digging up dirt from the frontstretch with a golden shovel. which is promptly put into celebratory mason jars. Nothing says "race winner" like "celebratory mason jars". 11:32 - Ryan Newman, on having no brakes for the last stint of the race "They're just a confidence builder here anyway". 11:26 - A full 18 months after his championship season, this is Austin Dillon's first ever Truck Series race as a NASCAR champion and, by extent, his first win. The winning team will be listed as RSS Racing, the family team of Ryan Sieg, but the car was prepared and run entirely by Richard Childress Racing. This will be just the fifth career win in the Truck series for Dillon, him having had two in both of his full seasons (2010 and 2011), and quite obviously his first ever on dirt. 11:25 - The combination of that final caution for debris and a block-happy Newman have kept Larson from having a shot at the end and Austin Dillon wins the first ever NASCAR race at Eldora! 11:24 - Ryan Newman gets ahead of Larson on the restart and blocks him for a lap and a half, giving Dillon a clear lead heading to the white. 11:22 - The top five on the restart will be Austin Dillon, Kyle Larson, Joey Coulter, Ryan Newman and Timothy Peters. 11:20 - Another caution for debris and we're headed to an overtime green-white-checkered finish. 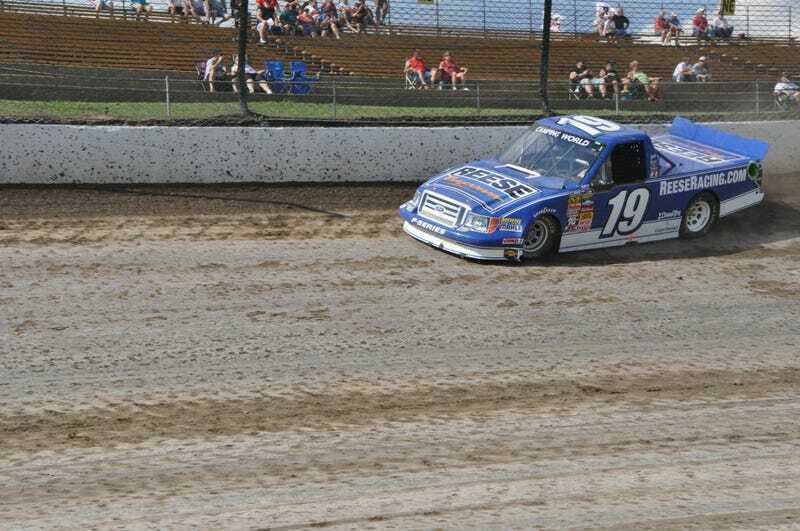 11:19 - We're back to green with five to go at Eldora! Larson and Newman are perfectly side by side for second and Larson takes the spot! 11:15 - The caution is out for more metal on the track! We'll have a shootout with about 8 laps to go. 11:14 - Larson tries the far outside and it doesn't work, causing him to fall about five car lengths off the battle for the lead! 11:12 - Newman is clearly holding up Larson, but he's also catching Dillon! It's a three way battle for the lead, all between Nationwide and Cup drivers in one-off Chevrolets! 11:10 - An awful restart for Larson who falls back to third and falls behind noted blocker Ryan Newman. Meanwhile, Ken Schrader moved from 9th to 5th in just two laps! 11:08 - 28 laps to go as we head to the restart. Austin Dillon will lead Kyle Larson and Ryan Newman to the green. 11:02 - Jared Landers spins and takes championship contenders Johnny Sauter and Ty Dillon with him. Landers's truck looks too damaged to continue, but the #98 and #3 look healthy enough to continue. We are now under caution. 11:00 - We're brack to green! Dave Blaney takes second from Kyle Larson then gets into the wall massively! Larson is back into second, but Blaney is still pressuring for the position. 10:58 - Forty Laps to go. Everything is on the line and it's about to get strange. We go green next time by. 10:45 - Side by side for the lead with 1 to go in the segment and they touch at 30 degrees of yaw! Dillon holds the position as the second segment ends. One more set of stops and then a 40 lap will follow to decide the race. 10:44 - Four laps to the end of the segment. Larson is still pressuring Dillon. 10:42 - Larson takes the lead and Newman slides into the wall on his own! Larson is now throwing his tail out far further than anyone else in the field as he focuses on chasing down Austin Dillon. 10:40 - We're back to green with 14 laps to go in the segment. Larson falls to third on the restart and Ryan Newman moves in to second! 10:36 - The yellow is out for debris on the track. Dillon was scored as the leader when the caution came and will start ahead of Larson. 10:35 - Larson gets held up by German Quiroga and Austin Dillon takes the lead! One lap later, Kyle Larson makes a move on the outside to take the lead! 10:34 - Larson now in heavy traffic. Austin Dillon has moved into second and is slowly catching Larson. 10:32 - Ryan Blaney, still a lap down, is about 17th on track after some adjustments. If he can get back on the lead lap quickly, he could move back up through the pack. 10:30 - Johnny Sauter and Ty Dillon have some contact fighting for 10th, but Dillon clears Sauter, who then bumps into the outside wall on his own. 10:27 - Dave Blaney slides up the track and loses his contact with the leader. Austin Dillon now fighting Blaney for second. 10:26 - Larson still leads Blaney, but Dillon and Newman have taken 3rd and 4th from Peters. Meanwhile, the #84 of Jeff Babcock is smoking, possibly with an engine issue. 10:25 - We're back to green and it's four wide throughout the pack! Larson holds the lead! 10:24 - We're about to go green for segment 2, which is 50 laps long and will take us to lap 110 of 150. 10:16 - Pit stops are fairly slow when the field is frozen! The first half of the field have completed their stops and now the back half of the field will go behind the wall to do the same. 10:12 - Looks like this caution will transfer directly into the end of the first segment. That means it's time to freeze the field (and the lap count) to change a few tires and add a bit of fuel. 10:10 - Austin Dillon taps a lapped Scott Bloomquist, and the result was a large chunk of metal flying out of the back of the #51. It has brought out the caution. 10:09 - Ryan Blaney, one of the most impressive drivers in practice, is in 23rd and about to be lapped by Larson! Meanwhile, Dave Blaney has taken second from Timothy Peters. Austin Dillon and Ryan Newman are now dogging Landers for fourth. 10:08 - Larson now leads by nearly 3 seconds with 12 laps left in this segment. 10:05 - Kyle Larson takes the lead from Timothy Peters! He passed nearly half the field in just 20 miles of racing! 10:04 - Kyle Larson is side by side with Timothy Peters for the lead! Meanwhile, Austin Dillon has driven from 19th to 5th! 10:03 - Kyle Larson takes second on the outside and now he's pushing Peters for the lead! 10:02 - Kyle Larson is now on Blaney's bumper! The three leaders are now entering lap traffic for the first time, starting with Scott Bloomquist. 10:01 - We're back from commercials and Dave Blaney is still pushing hard to take the lead from Peters. Larson is quickly reeling them in, dwindling what was once a three second lead down to just one. 10:00 - Scott Bloomquist, expected to be one of the favorites in the field by many before the start of the event, is now sitting in 30th of the 30 cars entered. 9:59 - Larson moves into third and he's still climbing! 9:57 - Kyle Larson has moved from the 13th starting position all the way to 5th and he's still climbing! He takes fourth from Jared Landers! 9: 56 - Peters executes a PERFECT slide job to take the lead, but Schrader dives back to the inside and leads the lap! Schrader then falls back and now sits in third. 9:55 - Peters goes to the inside but fails to clear Schrader. Dave Blaney is now pressuring Peters for second. 9:54 - Jared Landers made a move for the lead on Schrader, but he slows and it allows Timothy Peters and Dave Blaney to pass him! Peters, a driver with essentially no dirt experience, is now fighting for the lead! 9:52 - Lap 5 and we're still three wide through MOST of the field! Ken Schrader is leading Jared Landers by about half a second. 9:51 - We are GREEN at Eldora and four wide into one! Kenny Schrader leads out of turn 2! 9:50 - Lights are off on the pace car. We're just seconds from going green for the first 60 lap segment of the inaugural "Mudsummer Classic". 9:47 - We're going green in two laps, but before that, a four wide parade lap to salute each and every fan in the grandstands. 9:41 - The engines are fired and we're about to start the pace laps. 9:34 - A high school marching band is currently playing a fantastic rendition of "The Star Spangled Banner". We're about 10 minutes from the race itself. 9:05 - After the evening's heat races and the last chance qualifier, the cushion at the top of the track is already completely negated. That will weaken the outside line and widen the track as a whole, unless the track is re-watered between now and the start of the feature in about 30 minutes. 8:59 - The world is abuzz with the name "Stormin'" Norman Benning. A man known mostly for finishing multiple laps down and causing wrecks on plate tracks is the star of the heat races. In his interview, what I'm guessing is his first live nationally televised interview ever, he says what we're all thinking: "never lift!". 8:52 - What a fight for the transfer spot! Weller and Greenfield did everything they possibly could, but Norm Benning refused to give in and he will make the field for the first ever NASCAR race at Eldora! His truck looks absolutely demolished, with the exhaust pipe sagging on the ground, but he doesn't care in the slightest. Norm Benning, who will start 30th and likely finish there, is the star of the moment. 8:51 - Clay Greenfield and Jimmy Weller are chasing Norm Benning for 5th! Benning and Greenfield touch but Benning keeps the spot! One to go! 8:50 - We're restarting two wide with four to go. 8:47 - Jimmy Weller spins with 4 to go to bring out the caution! There will be four laps to go when we go back to green. Currently in transfer spots: Newberry, Babcock, Jennings, Bowles and Benning (!). Currently out: Greenfield, Weller III, Cobb, Silas and Heffner. 8:45 - Norm Benning is ahead of Clay Greenfield for the final transfer spot. Justin Jennings, Jason Bowles, Norm Benning and Clay Greenfield are all in a pack together fighting for third. 8:44 - FIVE WIDE entering turn 1 for the lead and FIVE WIDE out of turn 2 for third! JR Heffner, the clear fastest truck of every one in this LCQ, has an issue and goes to the garage! 8:43 - Cars are rolling off for the LCQ. Ten trucks going for the final five spots in the first NASCAR dirt race in forty years. A shot at history is on the line as we come to the green. Five of these ten will transfer in to the feature race. 8:31 - David Caraviello gives us a look at the right side of Scott Bloomquist's #54 truck. In dirt racing, that's what constitutes "ready for the start of the race"! 8:27 - Looks like everything from here on out is going to be live on SPEED! At the moment, they're talking with Kyle Larson, who just referred to a massively powerful, massively light Silver Crown car as "slow and heavy"! 8:07 - The last chance qualifier is set to start at 8:45 PM local time, about 35 minutes from now. A dirt late model race is on track in the interim, which should add some significant rubber to the track. 7:58 - Ty Dillon and Johnny Sauter make contact! Burton wins over Newman, Dillon, Sauter and German Quiroga. Newman transfers in, while Justin Jennings and Bryan Silas will go to the last chance qualifier. 7:57 - Burton takes the white flag. 7:56 - Ryan Newman is there and he's going for the lead! He goes to the bottom on Jeb Burton, but fails to take the position. He takes the lead with a slide job, but Burton crosses back over and retakes the lead! 7:55 - Heat 5 is green! Johnny Sauter is already going for the lead, and Ryan Newman almost takes it three wide! Burton leads lap 1, but Newman takes P2! Newman, Silas and Jennings are the ones who will be fighting for the transfer position. 7:45 - Buescher goes to the bottom and tries to take the lead in the last corner, but he doesn't have enough and Kenny Wallace wins heat 4! Max Gresham takes third and the transfer spot, while Austin Dillon finishes fourth and John Wes Townley finishes sixth. Brennan Newberry and Joe Cobb will go to the last chance qualifier. 7:44 - Wallace leads easily after 4 laps of 8. 7:42 - Buescher jumps to second over Gresham, and he's already trying to chase down Kenny Wallace. 7:40 - Heat 4 coming to green. Wallace will try to make it two NASCAR veterans named "Kenny" from St. Louis winning heat races today from pole. Newberry, Cobb and Gresham are the drivers that will fight for the transfer spots in this heat. 7:33 - Peters wins heat 3 with ease! Larson makes a move on Gaughan for the position late, but fails to take the spot and finishes third. Ron Hornaday and Ryan Blaney slot in 5th and 6th, while fourth place Jason Bowles and seventh place Clay Greenfield will go to the LCQ. 7:32 - Larson takes P3 and the transfer spot over Bowles, but Bowles hasn't given up yet! Timothy Peters is still easily holding a massive lead over Brendan Gaughan. 7: 31 - Larson is already up to fourth and fighting with Bowles for a transfer spot! The first two heats have been won by a driver that isn't locked in, can Larson make it three? 7:30 - Peters leads the field to the green over Jason Bowles. Bowles, Larson and Greenfield are the trucks fighting for the transfer spot in this heat. 7:28 - Apparently Nationwide Series driver Justin Allgaier is a pit reporter for MRN in his off time. Not a guest analyst, a pit reporter. Apparently Turner-Scott Motorsports is at Rocketsport Racing levels of paying their drivers poorly. 7:26 - Concerns of a one-groove track seem unfounded in these qualifying races. Strong trucks should be able to pass on the inside all night long. 7:23 - For those who want live coverage while SPEED is on tape delay, Motor Racing Network has live audio here. 7:21 - Landers passes Crafton again but hits the wall! He wins over Crafton, with Paludo in third and Darrell Wallace Jr in fourth. Seventh place Dakoda Armstrong is the fifth locked in finisher, while Jeff Babcock and Norm Benning will go to the LCQ. 7:20 - Matt Crafton makes a big dive for the lead! Landers falls to second, but he's still going for it! 7:19 - Back to green for heat 2. Miguel Paludo, a Porsche Carrera Cup graduate of all things, is in second for this restart. Landers holds the lead and the transfer spot. 7:18 - Yes, I can confirm that only one of the not-locked-in drivers actually slots themselves onto the grid in each heat race. The other two will go to the LCQ regardless of where they finish in their heat. 7:17 - Caution at lap 5 of 8 in heat 2. Caution laps do not count in these heats. 7:16 - Darrell Wallace Jr spins from second! He's in the wall! 7:15 - Landers bounces off the wall, but keeps the lead over Wallace! He does it again! Two hits of the wall and he still holds the lead! 7:14 - Jared Landers leads Miguel Paludo for the start of heat 2! Wallace already passes Paludo for P2, and now he's fighting for the lead! 7:13 - From the looks of things, the LCQ is only for people who need to qualify, and not those who failed to put themselves on the grid by not finishing in the top 5 in a qualifying heat. That means that only the top driver needing to qualify in each heat will actually make the grid, with the other two falling to the LCQ. 7:09 - Apparently JR Heffner still needs to go to the LCQ despite finishing second in the first heat? That's not confusing or anything... I'd know for sure, but SPEED's showing Ray Dunlap looking at dirt instead. 7:08 - Ken Schrader win heat 1 over JR Heffner and Dave Blaney! Joey Coulter and Tracy Hines are also locked in, while Scott Bloomquist and Jimmy Weller III will go to the last chance qualifier. 7:06 - We're already halfway through the 8 lap heat 1 and Schrader is still leading. 7:04 - Heat 1 is already green, even though SPEED is still doing tape delayed preshow! 7:00 - Single lap qualifying took place earlier in the day, with the top time set by a 58 year old Ken Schrader. The full results are here. Schrader will be awarded the pole for tonight's race no matter where he starts, and since he's not locked in for the feature event, he may be awarded the pole despite not starting the race!